Welcome to Atlanta and Georgia State! The next day begins bright and early, with our first panel taking place on the 2nd and 3rd floors of the Creative Media Industries Institute. 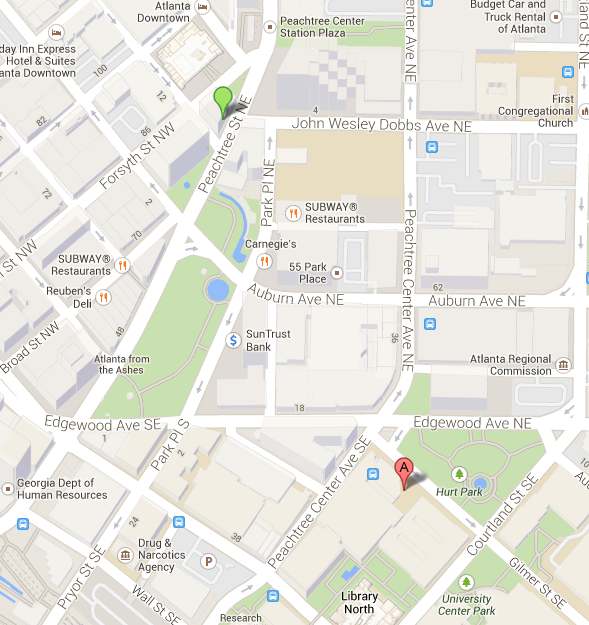 (CMII occupies the majority of the SunTrust Bank building in the center of the map above.) We look forward to seeing you soon! Visitors driving to campus should use G Deck to park on campus. There is a fee during the week (Thurs-Fri), somewhere around $6-8 for the whole day. On the weekends visitors can park for free. All visitors should use the Collins Street entrance, which can be accessed by taking Decatur Street and turning under the bridge by the sports arena entrance. On the map above, G Deck would be at the bottom edge, just below Library North.